Take ScienceWorkshop to the track or to the gym. Students can study the dramatic differences between EKG, heart rate and respiration before, during and after exercise. What if your students could actually see the results of plant transpiration as it happens? 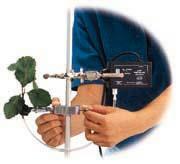 In a traditional lab, transpiration experiments were too difficult to do in a reasonable amount of time. With ScienceWorkshop, instantly see changes in transpiration when a leaf is placed in a sunny window or into the breeze from a fan. Compare the transpiration of high and low surface area leaves, desert dwelling cactus and tropical vegetation.